Crude oil prices extended gains on Friday lifted by recent data showing declines in crude output from OPEC and supported by an improvement in risk sentiment amid renewed hopes of a US-China trade deal. Traders also felt that Saudi Arabia's decision to increase the level of output reduction will significantly tighten crude supply in the market. The West Texas Intermediate peaked at $55.76 per barrel during Friday's session, the highest level since February. 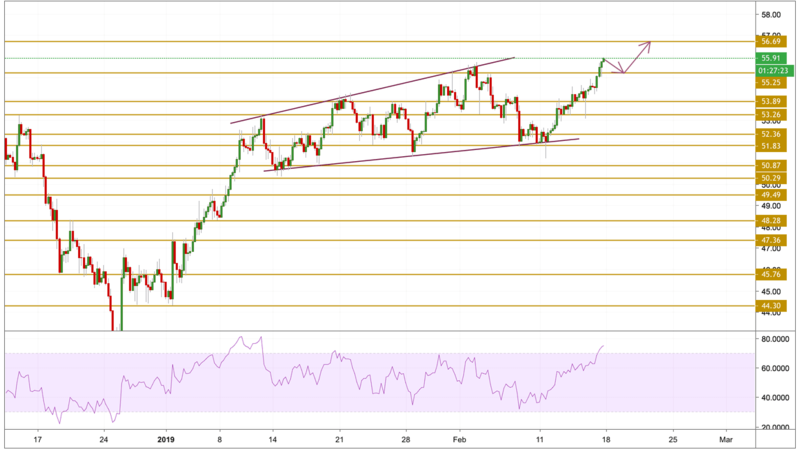 Crude oil prices retested previous highs at $55.76 per barrel and broke above it as the impressive bull run continues. The price is currently trading just below the $56 level in an extreme overbought state as the RSI points out. We expect a retreat towards near support levels before the bulls takes the price at the level we will be focusing on which is the $56.7 resistance level.